The project is the basic unit of work in Dradis Pro, each security assessment you work on is represented as a different project in Dradis. Represent vulnerabilities or findings. These are the things you'll end up including in your report. 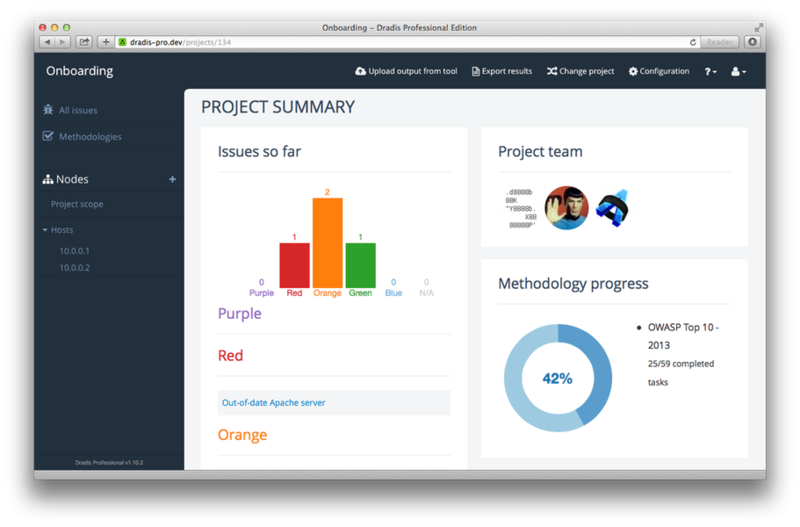 Each project is assigned a team (even if it is a team-of-one). Only people assigned to the project can work on it. Checklists of tasks you need to perform. Great to ensure you follow the same steps across all projects of a given kind. Containers, similar to "folders". It's how you structure your project. In a network assessment, they'll represent hosts, in a code review, they can represent different sub-modules or libraries inside the app. To view more than one project at a time, just use more than one tab! Each project URL includes the project ID (e.g. /pro/projects/123 for project 123) so you can open up Project 123 in tab A and Project 55 in tab B for quick and easy multi-tasking.